When it comes to gifts I often find choosing one thing for someone almost impossibly difficult, unless they've dropped some serious hints. Many of my nearest and dearest are a little like me, when asked what they would like they're not really sure. We've all reached a point where we're able to purchase the things we need and save up for the things we really want throughout the year. So when it comes to gifting, I've become known for curating a box filled with things I think the recipient will enjoy. There's something about a personalised box of goodies that is so lovely to receive. It really is the thought that counts and knowing someone has specifically chosen each thing for a reason can be quite special. With a little forward planning they're also incredibly easy to put together, and can be tailored to any budget. A box, some wrapping paper, tissue stuffing and some optional cellophane is really all you need to whip up a little something that can look as beautiful and sophisticated or as silly and fun as you like. Tracking down a beautiful gold box, popping in some white tissue paper and finishing with a ribbon always looks very chic. Covering a box with cutesy wrapping paper and including tissue paper in a clashing colour looks eclectic and fun. Whichever option I choose depends on the personality of the person the gift is for. As the Christmas season approaches gift sets are lining the shelves in the shops in abundance. Keeping an eye out for things like 3 for 2 offers on gift sets, makes them even more affordable and you can easily split up the items inside and use them to create some unique boxes to gift to your loved ones. With some help from the kind folks over at Boots, I've started to put together some of the hampers I'll be gifting this year because I'm determined to be more organised than I was last year. The items that Boots sent over to me will me marked with an *, but I've also been collecting things for a few weeks that I've included too. And although these are exclusively beauty themed, hampers can be curated for absolutely anyone depending on their interests! When it comes to my Mum, I'm certainly well known for occasionally going a little overboard. She rarely treats herself to new beauty things, but she does like to try them and I like to spoil her when she'll let me. A fragrance is something I usually like to include. I'm not sure that Angel will be the one this year, at the moment I'm thinking perhaps Black Opium or something Chanel, but we'll see. Two things that I have really enjoyed using this year are the Liz Earle Cleanse & Polish and the Sanctuary Spa Therapist's Secret Oil (these are both actually my current bottles of each) so I'm definitely going to be including them because I think they're wonderful. A Christmas scented candle is a must, and a couple of hand care products always go down well. 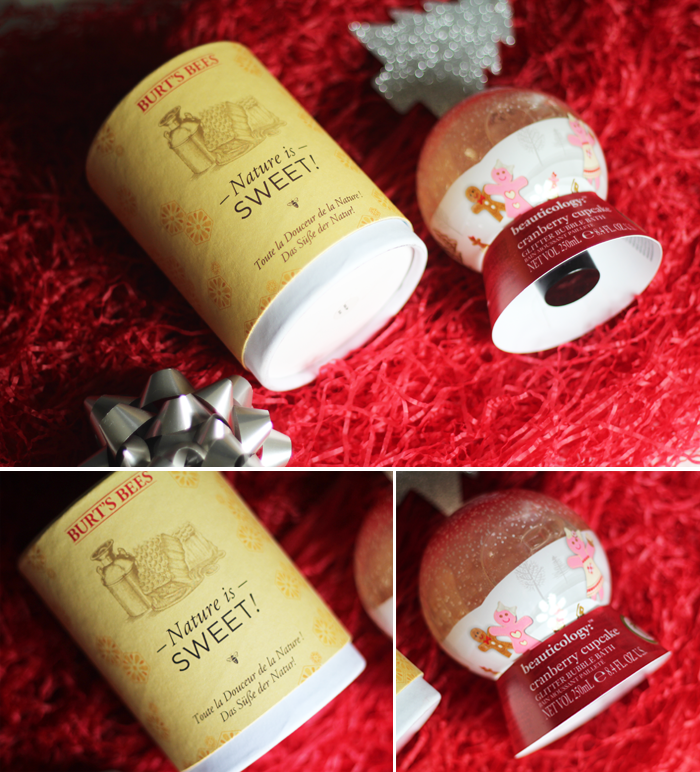 Side note, the Almond Hand Cream from Burt's Bees smells divine! I'm sure a few other bits and bobs will find their way in there along the way too, but I always have a lot of fun putting this one together each year. Close friends usually end up with a box of things I think are great and I hope they end up loving them too. They're always a bit of a mish mash, but sometimes I think those can make the best gifts - a little bit of everything is fun to dig in to. The Philosophy shower gel/bubble bath/shampoo and the Soap & Glory Hand Cream are each from separate gift sets that I've split up to give to a few different people. Removing the pretty festive packaging pains me a little especially if it's extra pretty, but I think it's worth it in the end. I do like to include one central item, something that I know they've been particularly wanting for a while or something I've seen that I know they will adore. The Benefit Real Cheeky Set is the star of this box, but I also couldn't resist including one of the Clarins Lip Perfectors because I love them so much. When it comes to buying for almost-teenage-girls I've yet to go far wrong with a bit of Soap & Glory. A pretty nail polish and a nice lip balm are the perfect accompaniments for the person this little parcel is for, but I also have a variant of this with a Hermione Pop! Vinyl and some sweet little notebooks. As I get older I find myself in charge of choosing little gifts for people I don't know particularly well. I won't lie, the gift fear always sets in a little when this happens but hopefully this little duo will go down quite nicely. I don't think it's possible to go too far wrong with some bubble bath, especially a festive scented one! Do you like to put together gift boxes for your loved ones? Or are you an expert at tracking down that one thing you know the person you're buying for will really love? You are a genius! I've been thinking about what to get my sister and I definitely think one of these is the way to go! 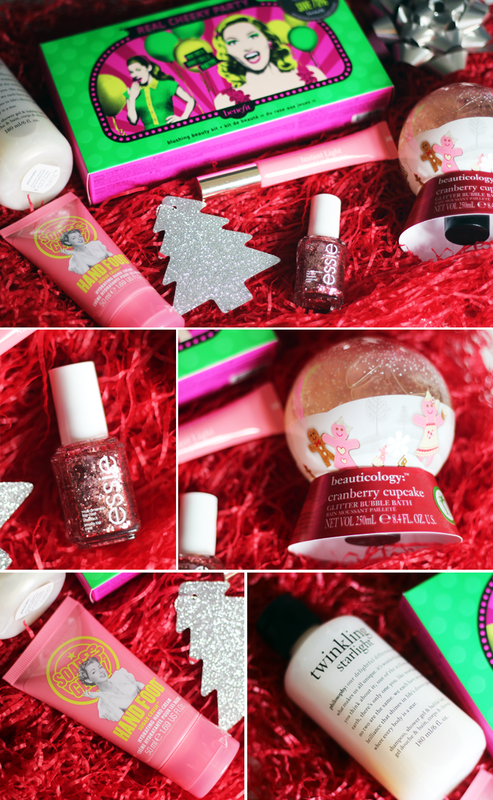 Oh my god...I love all these products..especially the sparkling nail polish and the lipbalm :)!!! Amazing ideas!!! I love the idea of putting together a little hamper as a Christmas present! What a lovely idea. I actually have considered doing something like this this year. I saw that Wilko in store are doing a make your own hamper thing with all the things you need like baskets and stuff. I also could not agree more about the Liz Earle Cleanse and Polish and The Sanctuary Therapist Oil - I have been using both of these relgiously over the last few months and are practically the only things which don't make my skin go haywire. I think what they say about great minds is true! I love putting together gift boxes too! I usually do get them a big something and then I throw some smaller things around, but it's really fun. Sometimes I buy them throughout the year because it makes the entire Christmas shopping easier. Loved your post & I think a hamper is such a great gift and you can make is so personal & also budget friendly. I love buying gifts for my mum for the same reason. She doesn't treat her self either, so this year I'm going to try a mixed bag of things. For my sisters as well. I get bonus points bring products like Soap & Glory, Urban Decay etc., because you don't get those brands in Cyprus. I think my friends would love some Burt's Bees or Essie too. I really like this idea. I hate getting gifts that are not what people want, so I end up collecting gifts all over the last two months of the year.